The GS108 moves huge files fast! 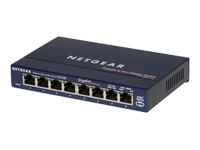 It features a high-speed, auto-switching 10/100/1000 Mbps Ethernet connection. And because Copper Gigabit Ethernet is a full duplex standard, you can get up to 2000 Mbps on each port. The GS108 integrates 10, 100, and 1000 Mbps devices on the same network. Every port automatically senses the right speed and full/half duplex mode, while Auto Uplink technology automatically adjusts for straight-through or crossover cables. LEDs embedded in each of the 8 RJ-45 jacks make for easy monitoring. Space-saving dimensions are ideal for desktop or wall mounting in home and small office environments. Strong, durable metal case securely protects the switch's working parts.